Our ROTOCAV hydrodynamic cavitator can treat edible oils, maximizing reaction yields: this means better product quality and less amount of reagents. The ROTOCAV cavitator is excellent in creating microbubbles inside its cavitation chamber, allowing a perfect homogenization that translates in increased surface area between the aqueous and the oily phases. Mass transfer and diffusivity are enhanced and chemical kinetic is the only limit for the process. - Degumming (liquid-liquid reaction): oil is mixed with water and/or acid to hydrate phosphatides. - Alkali refining (liquid-liquid reaction): degummed oil is mixed with an alkali solution to decrease the free fatty acid content and other impurities. - Bleaching (liquid-solid reaction): edible oil is decolorized by typically adding and mixing clay or diatomaceous earth. 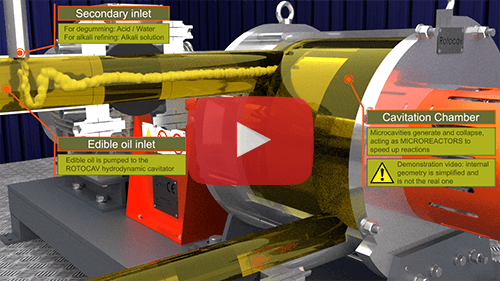 A new video about our ROTOCAV hydrodynamic cavitator, to explain and animate what happens inside our equipment when you need to pretreat different biomasses, for example for biogas or bioethanol productions. 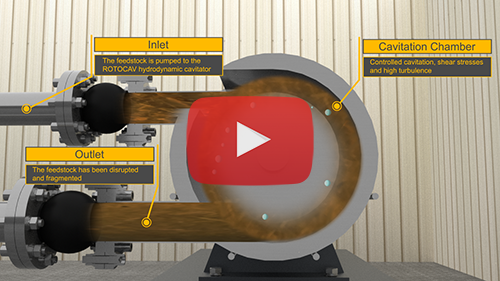 The feedstock is pumped to the hydrodynamic cavitator, then thanks to controlled cavitation generated inside the cavitation chamber, the biomass is subjected to a fast physical destructuration, making it easier to access its internal structure. High speed microjects and shock waves are generated during asymmetrical violent collapses of microbubbles, giving a final homogenized product without large organic particles and long fibers. ROTOCAV hydrodynamic cavitator is a green and sustainable process based on a non conventional technology for process intensification. The technological development, the innovation and the research of new solutions are the drivers to implement circular business models. The conscious choice of the Companies towards the innovation technological development represents the concrete possibility to introduce new tools for profit for the Company itself. ROTOCAV hydrodynamic cavitator developed by E-PIC S.r.l. is able to optimize yields, to reduce wastes and inefficiencies. By using our ROTOCAV hydrodynamic cavitator you can make the most of raw materials, you can reduce the consumptions and you can reach the maximum exploitation of the resources. The ROTOCAV is able to valorize wastes, for example in the production of biodiesel from exhausted oils, or in the valorization of agricultural wastes with the extraction of biocomponents, such as carotenoids from seeds and peels of tomatoes and oleuropeine from olive leaves. 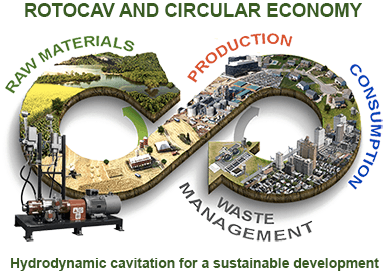 Our ROTOCAV hydrodynamic cavitator represents the creation of a value towards the innovation, a technology that runs through the ways of a sustainable development. 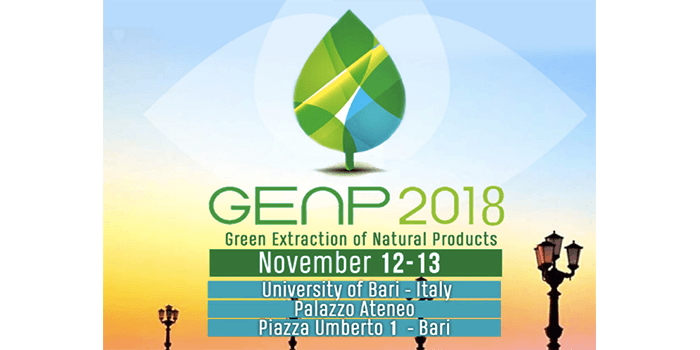 12-13 November - ROTOCAV will be presented as a Technological Innovation at the International Congress on Green Extraction of Natural Product (GENP2018 - Bari - IT). GENP2018 is focused on agro-food, nutraceuticals, cosmetic, chemical and energy fields. The whole value chain of each application is considered: farming, extraction, purification, processing and recycling steps. An overview on the most advanced green extraction technologies and sustainable processes will link scientists and experts within and across disciplines from around the world. The goal of this Congress is to facilitate the interaction between experts from industry and academic researchers, in order to promote information exchange and generation of new ideas that benefit society. 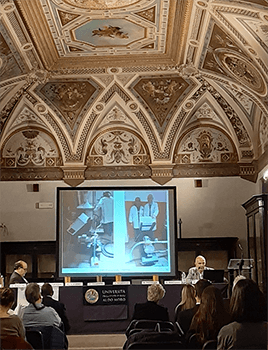 Read the abstract about our ROTOCAV presented at the Congress. ROTOCAV Hydrodynamic cavitators for enhanced animal-feed technology will be at Eurotier 2018, 13-16 November 2018, in Hannover. 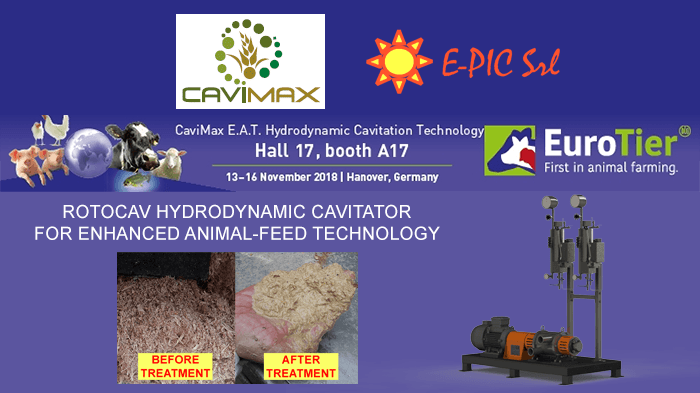 Our partner Cavimax will reply to your questions and explain how a ROTOCAV cavitator can be used to prepare animal feed. No more wasted crops, animals will grow more, greater bioavailability of animal feed, utilization of maize silage in pig feed, reduction of feeding costs, decrease in mortality, reduction in antibiotic use: these are the main advantages of installing a ROTOCAV cavitator. For more information and details on the event visit Eurotier website. Do you know that nature also uses hydrodynamic cavitation? The snapping shrimp, also known as pistol shrimp, is a member of the crustacean family living in tropical and subtropical areas, that uses hydrodynamic cavitation in its everyday life. This shrimp, with a size of no more than 5 cm, is characterized by a big claw, which is used as a gun, to stun and kill its preys, usually small fishes, shrimps and crabs, by using hydrodynamic cavitation. Its enlarged claw, which can be half of its entire body length, can be opened and closed very fast, in less than a millisecond: its particular geometry generates a high velocity water jet, travelling at about 100 km/h; this high velocity jet produces a low pressure area and so a cloud of vapour bubbles which implode on its prey. The cloud of bubbles implodes at about 3 mm far from the claw, when the pressure of the surrounding water increases. 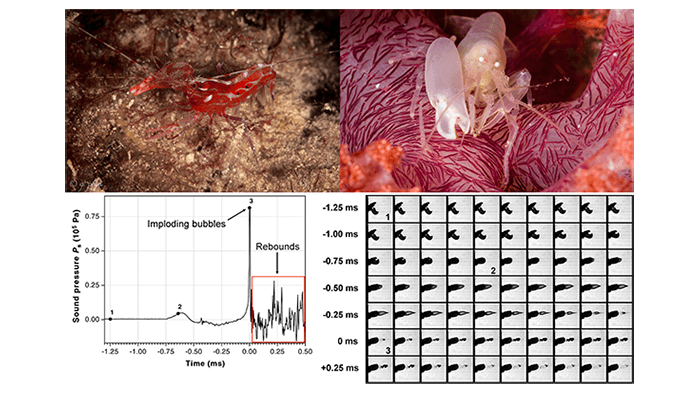 When the bubbles collapse, local high temperature (several thousands of degrees) and high pressure (several thousands of atmospheres) are generated, leaving no hope to the prey: pressure and temperature are so high that sonoluminescence can happen for few nanoseconds. Also known as sonic hunting, this is a way to stun and kill preys, without making use of direct physical contact.